The Liquid S1 needs to be well priced, as it's up against the Galaxy Note 3. If big screens are your thing, the Float features of the Liquid S1 nicely make the most of the phone's 5.7-inch display, making for a reasonable, if unremarkable, phone. 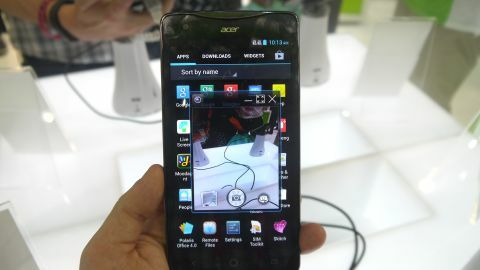 Considering the rise of larger smartphones on the market at the moment, we weren't all that surprised when Acer announced its very first 'phablet' handset, the Liquid S1, at this year's Computex, which seems set to cater to a more affordable, non-LTE market. The Liquid S1's 720p display measures 5.7 inches - just 0.2 inches more than the Samsung Galaxy Note 2 - and even packs a stylus pen like its Korean rival. This added padding means it might be slightly too big for some pockets. At a resolution of 1,280 x 720, matching the Note 2, the screen is certainly less than remarkable considering other devices rocking Full HD displays, such as the HTC One. But given that this will land at a more reasonable price, it's not something to get too caught up on. As for what's running on the inside, there's not an awful lot to get excited about. A 1.5GHz quad-core with just 1GB of RAM isn't cutting edge, but we found it's enough to run Android 4.2.2 smoothly on. The 8GB of storage is a bit skimpy too, though microSD support means you can beef that out when you need to. One thing that could be an off-putting is the 2,400 mAh battery, which doesn't match up to the Note 2's 3,100 mAh. Given we didn't have enough time to really test the battery out, it's difficult to know how big this difference will be. When it comes to the camera though, the offering is pretty reasonable. The Liquid S1's primary shooter is 8-megapixels, offering 1080p recording ability. This is decent enough, and the pictures we snapped were satisfyingly sharp for the device. Our favourite part of the Liquid S1, however, is its multitasking Float feature, activated by holding down the menu button. While the S1 software is mostly pure Android, Acer is throwing in its Float feature UI into the bag, which lets certain apps remain on the same screen as other "floating" apps and widgets at the same time. It's very reminiscent of the Multi Window feature of the Samsung Galaxy Note II (though we found this one a bit more fluid), and something that really takes advantage of that extra screen space. However during TechRadar's demonstration we were only able to use a very limited number of floatable apps, such as the calculator, camera and a call notification feature that means you won't be thrown out of whatever it is you're doing when someone's dropping you a line. We've been told that this will be opened up to more apps when the phone arrives officially, though a lot of this will be down to app developers too. Ultimately, the success the of Liquid S1 hangs in its affordability. A decent price - and it's currently said to be coming in at €349 (about £300, US $455, AUS $475) - is the only way we can see this taking on the Samsung Note 2, and given that its Q3 release date could put it directly up against the Note 3, it would seem ludicrous to put it any higher than that. But if big screens are your thing, the Float features of the Liquid S1 nicely make the most of the phone's 5.7-inch display, making for a reasonable, if unremarkable when it comes to specs, phone.